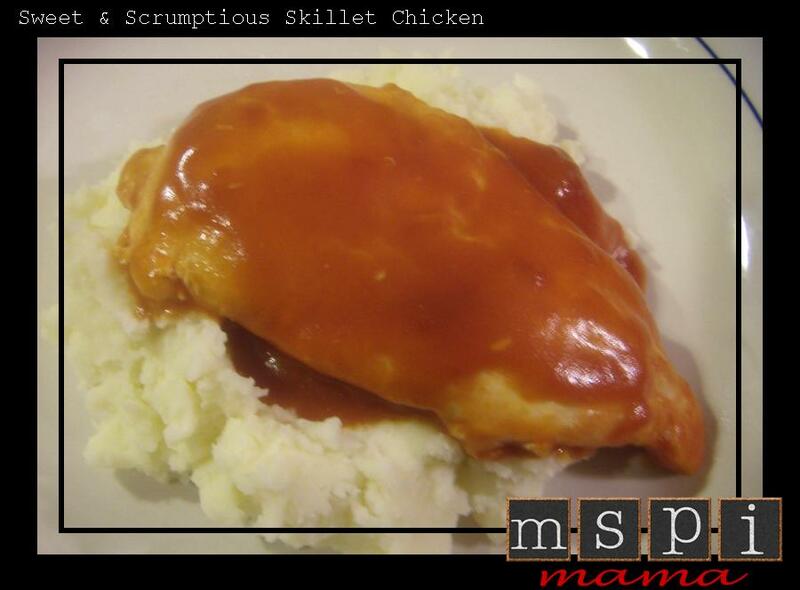 Regardless of it's silly name, the recipe is a family-pleaser and it's very simple to make. Plus it's not unusual to have all these ingredients on hand, if you have a well-stocked freezer and pantry. Don't know what to make for dinner tonight? Make this! I served ours with garlic mashed potatoes, but rice would be equally good. Heat the oil in a 10-inch skillet over medium-high heat. Add the chicken and cook until it's well browned on both sides. Stir the soup, sugar, vinegar and Worcestershire in the skillet and heat to a boil. Reduce the heat to low. Cover and cook for 10 minutes or until the chicken is cooked through. 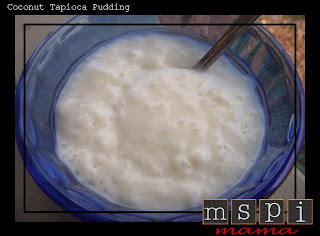 I've had this idea to make tapioca pudding with coconut milk for quite a while now, but never got around to trying it. Well, I finally did, and it is so rich and yummy that it'll knock your socks off! My son, JD, is just crazy about it! Now he has something creamy and delicious to eat when the rest of us are pigging out on ice cream! 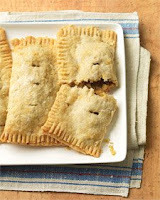 I adapted a recipe from Kraft Foods for my recipe. It's excellent both warm and cold. You could serve this with berries or use it as a dip for MSPI-friendly graham crackers. For extra coconut kick, try sprinkling the top of each serving with toasted coconut. Mix coconut milk, sugar, tapioca and egg in medium saucepan. Let stand five minutes. Cook on medium heat until mixture comes to full boil, stirring constantly. Remove from heat. Stir in vanilla. Cool 20 minutes; stir. Serve warm or chilled. (Pudding thickens as it cools. For creamier pudding, place plastic wrap on surface of pudding while cooling. Stir before serving.) Store leftovers in refrigerator. Tip: This recipe uses about 1-1/2 cans of coconut milk. For a lighter version, use a light coconut milk instead of the full fat version. It won't be quite as rich-tasting, but it will still be delicious! I'm baaaaack! I'm now in the second trimester, and the idea of cooking doesn't make me nauseous anymore! Woo hoo! I've been trying out a few new recipes, so hopefully I'll get them posted over the next few weeks. Here's the first. 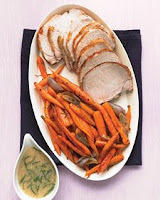 This pork recipe is beyond delicious! We're talking melt-in-your-mouth good! The flavors are incredible, and though the recipe's name has "spicy" in it, this isn't spicy hot. It's spicy flavorful. The original recipe comes from The Pioneer Woman, who is an incredibly talented cook, writer, photographer, etc. I made her recipe as written, but I cooked it in the slow cooker. So much easier! I've listed the slow cooker version below, but feel free to make it in the oven following the original directions. Rinse and pat dry the pork shoulder. Place in the slow cooker. To begin, just throw the dried oregano, cumin, chili powder, salt, black pepper, garlic, olive oil, white wine vinegar and brown sugar into a food processor or blender. Cut one onion into quarters and put it in the food processor with the spices. Blend mixture until totally combined and then pour it over the pork shoulder in the slow cooker. Remove pork from slow cooker and let cool slightly for easier handling. 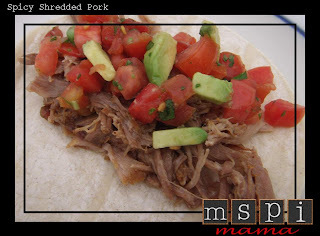 Shred the pork shoulder (two forks work well). When it’s all shredded, pour excess juices all over the meat, but if you prefer a drier meat, skip that part. Serve in tortillas with salsa and your favorite taco toppings, as I did in the photo above, or on MSPI-friendly hamburger buns with your favorite MSPI-friendly barbecue sauce. Hello friends. Sorry I've been MIA lately, but I have a very good reason: MSPI Mama has a bun in the oven -- and I'm not talking about bread! Our third child is due in early May, and we're super excited about it! Our daughter, Libby, can hardly contain herself! I'm nearing the end of the first trimester and starting to feel better, so I'm hoping to be trying out some new recipes and posting them sooner rather than later. In the meantime, check out my friend Michelle's new website: Intolerant Offspring. She has a ton of recipes for you to try. I hope things are going well for all of you! Take care! Who doesn't love the "San Francisco Treat"? Rice-a-Roni is comfort food at its best, but unfortunately, the boxed stuff usually isn't compatible with the MSPI diet. So Martha Stewart to the rescue! I found this recipe over at Everyday Food. It's super good and super easy -- well, not as easy as a box, but close! Hold pasta upright in a medium bowl, and, using kitchen shears, cut into 1/2-inch lengths; set aside. In a medium saucepan, heat 1 tablespoon oil over medium-high. Add onion; season with salt and pepper. Cook, stirring frequently, until softened and lightly browned, 3 to 5 minutes. Add rice, pasta, and remaining tablespoon oil. Cook, stirring frequently, until pasta is browned, 3 to 5 minutes. Add broth, and bring to a boil. Cover, reduce heat to low, and simmer until liquid is absorbed, about 15 minutes. Remove from heat, and let stand 5 minutes. 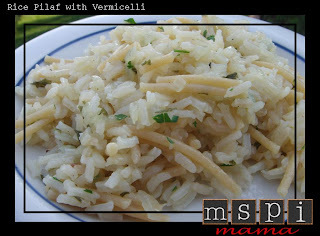 Add parsley, and season with salt and pepper; fluff pilaf with a fork. 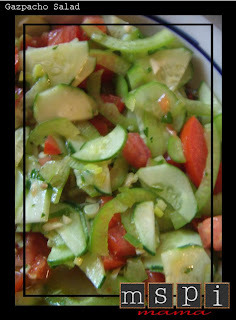 So what's a girl to do when she's got a whole lot of cucumbers and tomatoes -- and she wants to have Mexican for dinner? Well, she makes Gazpacho Salad! I found the original recipe at Taste of Home. I messed around with the amounts of the ingredients and left a few things out (because of personal taste and what I had on hand) but feel free to go with the original. It's completely MSPI-friendly as is. Also, the Taste of Home version says to stack everything in layers. I'm not that fancy; I just mixed it all up in a bowl. In a large bowl, gently toss together the first four ingredients. In a small bowl, combine the remaining ingredients. Pour over vegetables. Cover and chill several hours or overnight. Serve with a slotted spoon. Tip: Although the flavors intensify as this salad sits, it's still delicious served immediately without the wait. Who doesn't love ooey-gooey s'mores? Next time you go camping or attend a campfire outing, make sure you take along MSPI-friendly ingredients (marshmallows, graham crackers and chocolate -- I use MSPI-friendly chocolate chips) so you can enjoy this awesome treat! 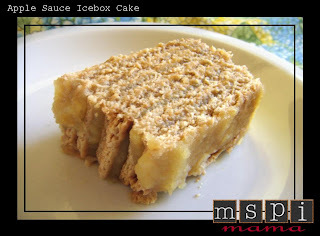 If camping and campfires aren't your thing, then make this yummy dessert! The original recipe came from Kraft Foods years ago, but I can't find the recipe on the website anymore. Thankfully, I still have a printout from 2002! Line a 13x9 inch pan with foil and coat with cooking spray. Place graham crackers on bottom of pan, cutting crackers to fit, if necessary. Microwave chocolate chips and 2 tablespoons margarine in microwave bowl on high for 2 minutes, stirring occasionally until chocolate is completely melted and smooth. Spread about two-thirds of the chocolate in a thin layer over the graham crackers. Microwave remaining 4 tablespoons margarine in a 4-quart microwavable bowl on high 45 seconds or until melted. Add marshmallows; toss to coat. Microwave 1-1/2 minutes or until marshmallows are melted and smooth, stirring halfway through. Stir in cereal. Press cereal mixture firmly over chocolate-coated graham crackers in pan. Reheat remaining chocolate. If desired, add a touch more margarine or shortening to help thin it out. Drizzle the melted chocolate randomly over the cereal mixture. Cool; cut into squares. A little tip: Before pressing the cereal mixture into the pan, I like to coat my hands with cooking spray. It helps keep the mixture from sticking to my hands! I know, another grill recipe, but it's summer. Gotta use that contraption while it isn't snowy or cold outside! This burger, which was adapted from a recipe in the August/September issue of Taste of Home, was super good. The original recipe includes a slice of cheese, but thanks to the avocado, I don't think you'll even miss it. Well, let's be serious. You'll miss the cheese, but I promise you won't be disappointed in this burger. It's delish! Isn't the avocado calling out to you? I whipped together a simple homemade salsa, but you can easily use your favorite store-bought version. In a large bowl, combine the first five ingredients. Crumble meat over mixture and mix well. Shape into four patties. Grill burgers, covered, over medium heat for 4-6 minutes on each side or until a meat thermometer reads 165° and juices run clear. 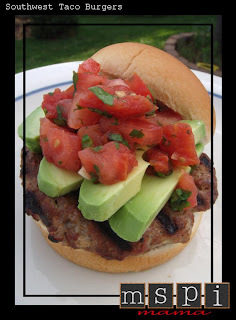 Serve on buns with avocado and salsa. It's official. Everything tastes better when it's been grilled. 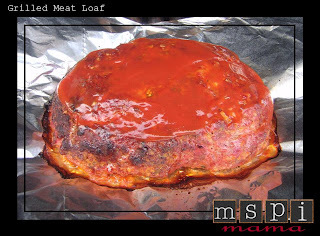 (Have you tried grilling your meat loaf yet?) Seriously, my family loves cauliflower and will eat it any way I cook it, but when it's grilled, they will devour it. The best part about this recipe is that it's easy to make and oh-so-easy to clean up. Just toss the foil. No dishes to wash! I used this recipe from Recipezaar for the method, but with an MSPI-friendly twist. Prepare grill and heat to medium. Remove stem and leaves from cauliflower. Wash and pat dry. Lay out a large piece of heavy-duty foil or stack two pieces of regular foil. 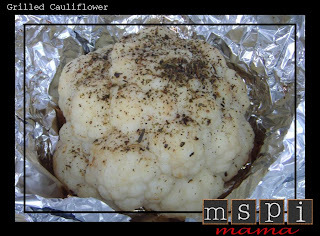 Place cauliflower head on foil. Gather sides of foil around the cauliflower, creating a loose bowl shape. Drizzle olive oil over the cauliflower. Sprinkle with seasonings -- adding more or less per your preferences. Wrap the foil around the cauliflower. Grill over medium heat about 30-40 minutes or until desired tenderness. Unwrap cauliflower and slice into pieces. I'm back! The new computer is up and running -- although the old computer's hard drive is completely fried. Unfortunately, I hadn't backed it up in ages, so tons and tons of photos and documents are lost. Please, learn from my very difficult lesson and back up your computer! Enough about me and my misfortunes, let's talk food! Here's a super yummy snack that my friend Laura brought to a lake outing for our small group from church. Seriously, I could have eaten the entire bag! The original recipe comes from Chex. Oven Directions: Heat oven to 250°F. Remove and discard unpopped kernels from popped popcorn. In ungreased large roasting pan, mix popcorn, cereal and peanuts. In 2-quart saucepan, heat margarine, brown sugar, corn syrup and vanilla to boiling over medium heat, stirring frequently. Pour over cereal mixture, stirring until evenly coated. Bake 45 minutes, stirring every 15 minutes. Spread on waxed paper to cool, about 15 minutes, stirring occasionally to break up. Store in airtight container. Microwave Directions: Remove and discard unpopped kernels from popped popcorn. 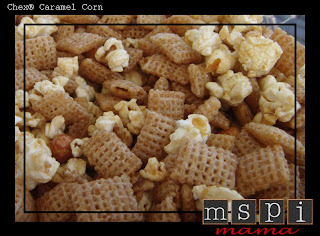 In large microwavable bowl, mix popcorn, cereal and peanuts; set aside. In medium microwavable bowl, microwave margarine, brown sugar, corn syrup and vanilla uncovered on High about 2 minutes, stirring after 1 minute, until mixture is boiling. Pour over cereal mixture, stirring until evenly coated. Microwave uncovered on High 5 to 6 minutes, stirring and scraping bowl after every minute. Spread on waxed paper to cool, about 15 minutes, stirring occasionally to break up. Store in airtight container. Until then, peruse some of the old recipes. They're yummy, too! We went to visit my parents in Kansas last weekend. While the rest of us were pigging out on ice cream, my mom made this old-fashioned dessert just for JD, and he couldn't get enough of it. This is the perfect first dessert for an MSPI baby. It's super simple to make. I didn't indicate any measurements because you can make it as big or as little as you want. I like to use a loaf pan. Be generous with the apple sauce! 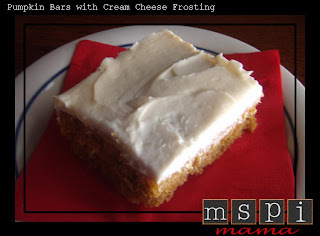 It soaks into the graham crackers and creates a soft texture. 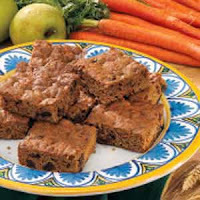 Spoon a layer of apple sauce in the bottom of a square or rectangular casserole dish or baking pan. Follow with a single layer of graham crackers. Cover graham crackers with a layer of apple sauce and repeat to top of pan, ending with a layer of apple sauce. Cover and place pan in refrigerator for several hours. Oh yeah! More food on a stick! This makes a great side dish to just about anything you cook on the grill. I served it along with the Beer Can Chicken. It worked out really well to cook these kebabs on the "hot" side of the grill while the chicken hung out on the indirect side. The original recipe comes from Taste of Home. I didn't have any peppers, like the recipe recommended, so I just skipped them. You can adapt it to whatever vegetables you have on hand. In a large saucepan, cook onions and carrots in water for 10 minutes or until crisp-tender; drain. In a large bowl, combine oil and seasonings. Add the vegetables; stir to coat. Cover and refrigerate for at least 1 hour. Thread vegetables alternately onto skewers. (If using wooden skewers, soak them in water prior to use.) Grill over medium heat, covered, for 15-20 minutes or until tender. I love oatmeal raisin cookies, but Libby isn't a big fan of raisins. No problem, just make the cookies without the raisins, but where's the fun in that? The raisins are the best part -- in my humble opinion! They just add a depth of flavor that makes the oatmeal sing. Well, this recipe from the Gooseberry Patch's "Simple Country Pleasures" is a wonderful compromise. The lemon helps elevate the oatmeal, and there are no raisins for Libby to complain about! 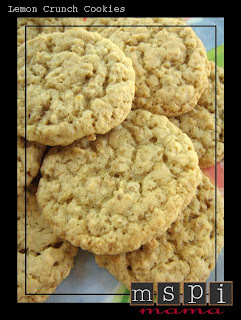 Usually when I make cookies with margarine, the cookies spread and end up thin and crispy, but the cream of tartar in this recipe helps the cookies hold their form and gives them a nice crunch. In bowl, mix flour, cream of tartar and baking soda; set aside. Cream margarine and gradually add sugar. Beat at medium speed until well blended. Add lemon juice, lemon zest, egg, allspice and salt; beat well. Gradually add flour mixture and mix until combined. Stir in oatmeal. Drop by teaspoonful onto cookie sheets, and bake for 12 minutes. Makes 3-1/2 dozen. This method of cooking chicken was all the rage a few years back. You couldn't watch a cooking show on TV without the host making this recipe. However, this is the first time I've ever made one, and I really wish I had done it sooner! It's really super easy and looks incredibly impressive. The hardest part about the recipe is getting the hot chicken off the can when you're ready to eat. I ended up holding the can steady with a sturdy pair of tongs, while pulling the chicken off with another set of tongs. There's probably a better way to do it, so let me know if you figure one out! I used this recipe from The Surreal Gourmet over at the Food Network as my starting point, and then I used this Tyler Florence recipe for a dry spice rub. I was very happy with the results of the rub on the chicken, but you could easily skip the rub and just be generous with the salt and pepper. If you prefer not use beer, then I think you could probably use a can of Coke or Sprite with similar results. I really didn't taste the flavor of the beer in the chicken. The beer itself just helps add moistness to the meat, not so much flavor. Prepare grill for indirect cooking. Combine the salt, pepper and spices together in a small bowl. Remove neck and giblets from chicken and discard. Rinse chicken inside and out, and pat dry with paper towels. Rub chicken lightly with oil then rub inside and out with the dry rub. Set aside. Open beer can and pour off (or drink) half the can. Place beer can on a solid surface. Grabbing a chicken leg in each hand, plunk the bird cavity over the beer can. Transfer the bird-on-a-can to your grill and place in the center of the grate, balancing the bird on its 2 legs and the can like a tripod. Cook the chicken over medium-high, indirect heat (i.e. 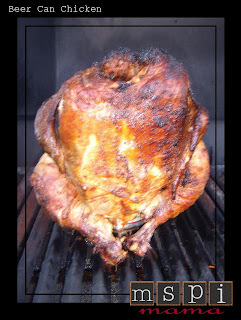 no coals or burners on directly under the bird), with the grill cover on, for approximately 60-85 minutes or until the internal temperature registers 165 degrees in the breast area and 180 degrees in the thigh, or until the thigh juice runs clear when stabbed with a sharp knife. (The exact cooking time will really depend on how hot your grill is, so be flexible and make sure you use a thermometer!) Remove from grill and let rest for 10 minutes before carving. 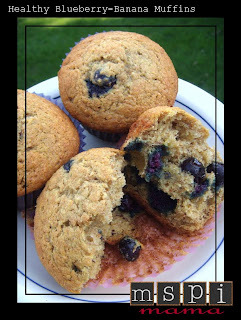 These muffins are a super yummy way to kick start your day. And, as the name implies, they're healthy, too! Just beware: If you give them to your kiddos, be prepared to change many diapers! JD ate one for breakfast, and we had to change FOUR diapers that day. Lots and lots of fiber! The original recipe comes from Everyday Food. It calls for using wheat germ, but I used oat bran instead, so that's what I've listed in my version. Use what you have on hand or can find easily at your grocery store. Preheat oven to 375 degrees. Line a 12-cup muffin pan with paper liners. In a bowl, whisk together flours, oat bran, baking soda and salt. In a large bowl, beat margarine and sugars with a mixer until light and fluffy. Add eggs, one at a time, beating well after each addition. In another bowl, mash bananas with a fork (you should have 3/4 cup); stir in milk substitute and vanilla. With mixer on low, alternately add flour mixture and banana mixture to margarine mixture, beginning and ending with flour mixture; mix just until combined. Fold in blueberries. Divide batter among muffin cups. Bake until a toothpick inserted in the center of a muffin comes out clean, 25 to 28 minutes, rotating pan halfway through. Let cool in pan 10 minutes; transfer muffins to a rack to cool 10 minutes more. My neighbors have been so generous in sharing some of their garden bounty. Lots and lots of zucchini and summer squash. I put the zucchini to work in this yummy change of pace for spaghetti. The original recipe comes from Woman's Day. If you've never had polenta before, it's basically corn mush. Yeah, I know, it doesn't sound incredibly appetizing, but it's really good and it pairs beautifully with this chunky sauce. The original recipe calls for mixing some Parmesan cheese into the polenta, but we obviously can't do that. However, if you would like a creamier polenta, try substituting all or part of the water in the recipe with your favorite MSPI-friendly milk substitute. You can also mix in a pat or two of MSPI-friendly margarine. 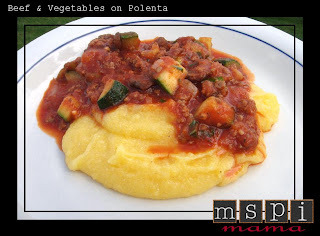 If you're still not sold on polenta -- which would probably make a cheap, homemade baby food! -- you can just put the sauce on pasta. And just leave the beef out for a yummy vegetarian option. Mix water, cornmeal and salt in a 2-quart microwave-safe bowl. Cover with vented plastic wrap and microwave on high, whisking every minute, until thick and smooth. This can take 6-10 minutes. Add more salt to taste. The polenta will continue to thicken upon standing. Meanwhile, heat oil in a large nonstick skillet over medium-high heat. Saute zucchini and mushrooms 5 minutes, stirring often, until tender. Transfer to a serving bowl. Add beef and onion to skillet; cook, breaking up with a spoon, until browned, about 3 minutes. Stir in rosemary, basil and garlic; cook 1 minute. Stir in marinara and bring to a simmer. Add zucchini and mushroom mixture; heat through. Spoon polenta onto plates and top with sauce. There's nothing more pitiful looking than a pizza without cheese. Yeah, we eat it that way because we don't have much choice, and if we close our eyes, we can pretend it's "normal" pizza because the flavor is still darn good. But a cheese-free pizza still looks naked. So I figure a calzone is a great way to get around this predicament because everything is hidden inside the crust! I had some leftover pesto sauce and decided to throw it together in this recipe. It turned out really good! You could easily adapt this recipe to whatever veggies and meats you have on hand. A vegetarian version with sauteed mushrooms, onion, spinach and bell peppers would be great! Not feeling especially "green" today? 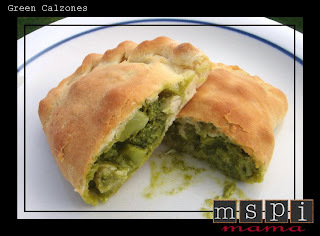 Red Calzones with pizza sauce, pepperoni and sauteed red peppers would be fun! If you have any extra filling leftover after using all your pizza dough, just toss it up with some pasta. Heat olive oil in a frying pan on medium-high heat. Saute chicken breast until halfway cooked, add broccoli until everything is cooked through. Set pan aside to cool slightly. Mix in the pesto sauce. Heat the oven to the temperature called for in the pizza dough instructions. Cut pizza dough into four pieces. Roll or pat one piece out into an 8-by-5-inch oblong shape on a well-floured surface. Spoon 1/2 cup of filling onto one side of the dough, leaving a 1-inch edge. Fold the other side over the filling, pinching the edges together. Place calzone on a cookie sheet. Repeat with other three pieces of dough and filling. Bake according to pizza dough instructions. Optional: Brush tops of the calzones with olive oil prior to placing in oven. There was a big meat sale at the store this week. I loaded up, big time: over 25 pounds of meat! Yes, I know, that seems crazy, but it all goes in the freezer. Stock up when it's cheap! One of the things I purchased was a package of turkey cutlets. I didn't really know what I wanted to do with it, other than grill it. I found this recipe from Everyday Food and swapped the turkey for the chicken. It turned out great! 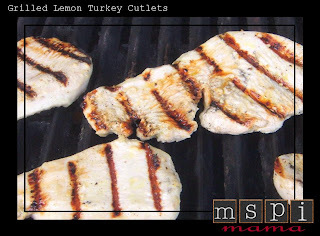 The lemon juice marinade tenderizes the meat and gives it a nice, subtle flavor. Heat grill to high. Mince the garlic clove, and place in a shallow dish. Add lemon juice and the oil; season with salt and pepper. Add chicken, and toss to coat. Let stand at room temperature at least 5 minutes (and up to 30). Grill turkey until opaque throughout, 1 to 3 minutes per side. Serve with lemon wedges. I've grilled asparagus before, following directions I found online. It tasted good but was kinda chewy. I mentioned this to my mom -- aka Martha Stewart. She said to blanch it first. Duh! Why didn't I think of that!?! So here's her version. Libby couldn't get enough of it. She would have literally eaten the ENTIRE bunch of asparagus, but I had to cut her off at 10 spears, in order to save some for the rest of us! Light your grill and get it nice and hot. While it's heating, fill a large frying pan with about a quarter-inch of water and set it on high on the stove. Once it starts to slightly boil, add the asparagus and simmer for 2 minutes. (You aren't looking to completely cook the asparagus at this point. You want it to remain somewhat crispy.) Remove asparagus from the pan and rinse in cold water to stop the cooking process. Pat asparagus with a towel to remove excess water. Place asparagus in a shallow dish and drizzle with olive oil and sprinkle with salt and pepper. Toss together. 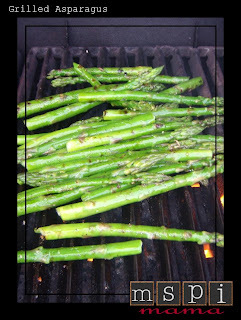 Once grill is ready, place asparagus on the grates and grill, flipping occasionally, until the spears are slightly charred and warmed through. About 2-3 minutes, depending on the grill's heat. Return asparagus to the shallow dish, to sop up any excess oil, salt and pepper. Enjoy! Make-ahead tip: Prepare the asparagus through the oil, salt and pepper step. Cover and place in the fridge, up to a few hours, until you're ready to grill. Want to make your kids (and you!) super happy? Then make this uber-delicious, oh-so-cool summertime treat! My daughter, Libby, obviously can't get enough of them! 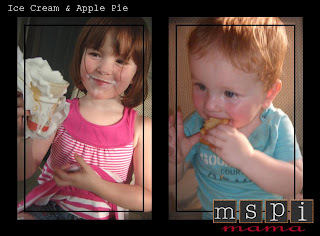 I found this super-simple recipe on Weelicious, which is a fun baby and toddler food blog. Go check it out! I made the recipe as directed, but I was thinking that it easily could be adapted to your favorite fruits or whatever you happen to have on hand. And if you aren't in the mood for Popsicles, when refrigerated, the mixture gets nice and think and creamy -- almost pudding-like. So yummy! Pour ingredients into a blender and puree. 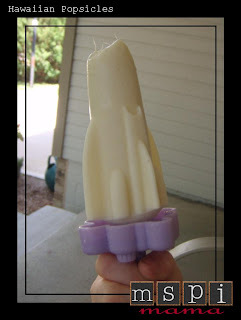 Pour into Popsicle molds and freeze at least four hours or until set. Serve. I've always made tabbouleh salad with cracked bulgur wheat, which is delicious but it takes quite a bit of time because you have to soak the grain for several hours. 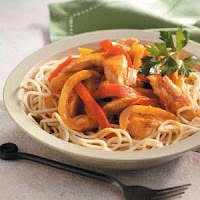 This recipe from the July '09 issue of Woman's Day uses couscous, which cuts back dramatically on the preparation time. And it tastes great, too! You may be asking: Ummm, what's tabbouleh? Pronounced "tuh-boo-lee," it's basically a Middle Eastern pasta salad. I served this with the Armenian Beef Kebabs. An excellent pairing! I tweaked the recipe a little bit because I didn't have any fresh mint on hand. Here's my version. Heat water in small saucepan to a boil. Stir in couscous, cover with lid and remove from the heat. Allow couscous to soak up water for several minutes. Once water is absorbed, fluff couscous with fork, then let cool. 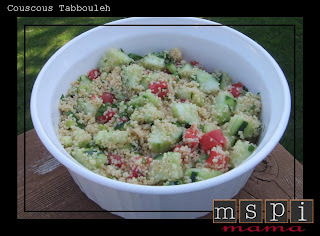 Once cool, toss with remaining tabbouleh ingredients in a large bowl. There's just something about food on a stick that gets people -- especially husbands and kiddos -- excited. When I saw this recipe in the July '09 issue of Woman's Day, I figured it would be fun to try and a new way to use ground beef. It didn't fail me! Libby was absolutely fascinated by the skewers, and my husband loved it, too. I broiled the kebabs, as directed by the recipe, but next time I'm going to use the grill and keep the heat outside. I tweaked the recipe, not because of MSPI but because I didn't have all the ingredients. I also explained some of the directions a little better. Here's my version below, but go ahead and try the original, too. 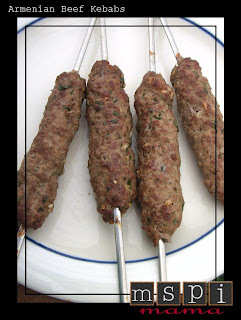 (Yes, I know the kebabs kind of look like something your dog might leave in the yard, but they really do taste good!) If you would rather not bother with the skewers, then just form the meat into patties, but like I said, the sticks make it fun! Mix together all ingredients, except the beef, in a medium bowl until well blended. Mix in the beef. Divide mixture into six equal portions (about 1⁄3 cup each). With hands, form each into a meatball shape, the force skewer through meatball. Then form the meat into a long sausage-like shape, about 1 inch thick, around each skewer. 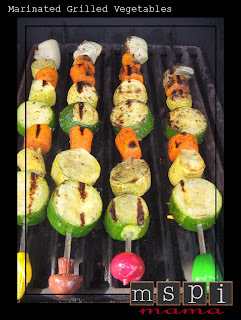 Place skewers on a broiler pan and broil 8 to 10 minutes, turning once. A note about skewers: If you use bamboo skewers, then make sure you soak them in water prior to putting the meat on them. This will keep them from catching fire. Berries are on sale and so delicious this time of year, so why not make a yummy dessert that showcases some of your favorites? This recipe, which I adapted from "Life's Little Berry Cookbook," is simple to mix up and just melts in your mouth. Libby had a lot of fun helping me layer the blueberries and strawberries on top of the batter. Feel free to use whatever types of fruit you like or have on hand. Peaches and raspberries would be excellent! I would normally serve this with a drizzle of cream, but that's obviously not an option. Instead, why not try a drizzle of coconut milk? Make sure you serve this while it's still warm from the oven! Preheat oven to 350 degrees. Grease an 8- or 9-inch square baking pan. In a small bowl, cream 1/4 cup margarine and 1/2 cup sugar. Blend in the egg and vanilla. In a small mixing bowl, stir together 1 cup of the flour, baking powder and salt. Add dry ingredients to creamed mixture alternating with the milk substitute. Stir until well blended. Pour batter into prepared pan. Arrange fruit over the batter. In a small bowl, combine remaining sugar, flour, cinnamon and nutmeg. Cut in remaining margarine until mixture is crumbly and sprinkle mixture over fruit. Bake for 35 minutes or until golden on the edges and the middle is set. An 8-inch pan will take longer to bake. A note about margarine: There are only a few margarines on the market that are MSPI-friendly. Some of these are "light" versions. I highly recommend NOT using light margarines in your baking. If you can't find an MSPI-friendly, non-light margarine (I use Fleischmann's Unsalted for baking.) then I recommend using a butter-flavored shortening. Light margarines have too much water in them, which won't allow your dessert to bake correctly. Ice cream is something we all miss on this diet. Have no fear, here's some dairy-free ice cream to the rescue -- thanks to my friend Michelle, who shared some recipes with me. She made this vanilla version and added Oreo cookies. She also made this chocolate version. If you're not familiar with agave syrup, it can usually be found in the natural foods section, but you can sometimes find it with the honey. If you would rather use sugar, just keep taste-testing until you find an amount you like, and make sure you let it dissolve before adding the mixture to your ice cream maker. Yes, this recipe is pretty expensive to make, but it's still much cheaper than buying coconut milk ice cream from the store. I was craving some Mexican food a few weeks back, but I didn't want the usual taco standby, instead, I made this recipe from Everyday Food Magazine. Obviously, skip the sour cream and cheese, but I seriously did not miss 'em. 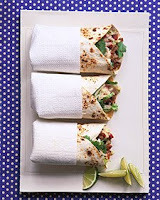 The filling is incredibly flavorful, and as a nice twist, I paired the burritos with Carrot-Cumin Slaw. In fact, I didn't bother with chopping up some lettuce and cilantro; I just topped the burritos with a little bit of slaw. Very good! 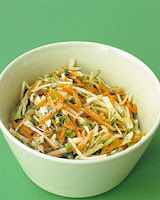 The next time you decide to make Mexican for dinner, consider having this slaw recipe from Everyday Food Magazine as part of the meal. It is so flavorful! My husband even had seconds -- that's a miracle! He never takes seconds of a vegetable, much less a salad! If your taste buds prefer a milder version, just leave out the jalapenos. We had a group of friends over for a Memorial Day party. My friend Laura brought these cookies. They are sooooo good! Heat oven to 350. Place parchment paper on four baking sheets and set aside. In small mixing bowl, blend flour, baking soda, baking powder and salt with a whisk; set aside. In large bowl, beat shortening and both sugars on medium-high speed about 3 minutes or until light and fluffy. Add eggs, one at a time, beating well after each addition. Beat in vanilla. On low speed, gradually add flour mixture and beat until just combined. Stir in oats, Rice Krispies, coconut and chocolate chips. Form balls with two tablespoons of dough and place two inches apart on prepared sheets. Bake at 350 degrees for 10 minutes. Cool on sheets for five minutes then transfer to cooling rack to cool completely. If you haven't been using your grill yet this year, what's holding you back? Get out there and grill! Thankfully, grilling lends itself beautifully to MSPI cooking! This recipe from Betty Crocker is unusual in that you're cooking in foil, but it also allows you to adapt each packet to individual eaters. You daughter hates carrots? Then don't put carrots in her packet. So easy! Just make sure you use an MSPI-friendly barbecue sauce, and I recommend following the potato substitution at the bottom of the recipe. It'll be cheaper, and you'll know for sure that it's safe to eat! I've toyed with the idea of making coconut yogurt for quite sometime, but I really didn't want to buy a yogurt machine. The last thing I need is another appliance in my small kitchen! But this recipe is made in the slow cooker. Yippee! I already have one of those! I looked at two recipes for direction. The first is from A Year of CrockPotting, and the second is from Funky Food Allergies. I used five cans of coconut milk and one container of store-bought coconut milk yogurt to make it. I also mixed in an envelope of plain gelatin to help with thickening. Next time, I will use two envelopes of gelatin. If you can't find coconut milk yogurt to use as your starter, there are non-dairy yogurt starters available on the internet. One is from GI ProHealth. This can be rather expensive to make, but it's a lot cheaper than buying the store-bought coconut milk yogurt at $2 for 6 ounces! Plus, it is so good! When I was a kid, whenever we had leftover rice, my mom would make "eggy rice" for me. Basically, it's scrambled eggs with rice. I loved it and still do to this day, so this recipe from Everyday Food definitely appeals to me. The rice wine vinegar seemed like a strange addition to me, but it really adds a lovely sweet tang to the dish. If you don't have the vinegar on hand, the rice is still good without it. Leave the ham out for a great vegetarian option. As I've mentioned before, I am not a fan of coconut flakes, but it doesn't mean this blog has to be a coconut-free zone! 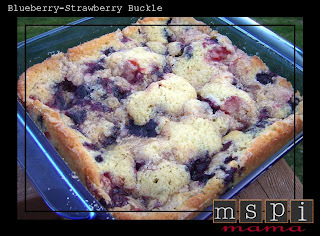 MSPI Mama-reader Nell recommended this recipe from Baker's. 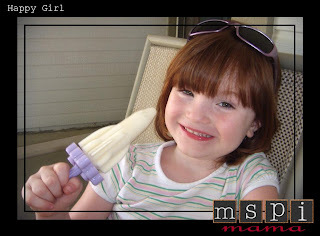 She made the chocolate-dipped version with MSPI-friendly chocolate and said they tasted just like Mounds candy bars. 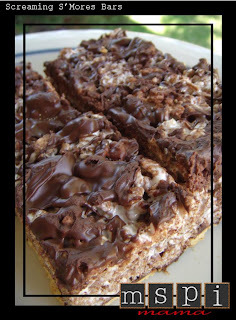 One of the readers of this blog, Nell, recommended this recipe from Hershey's, and it looks fabulous to me! Nell substitutes rice or almond milk for the regular milk with good results. She said the cake is so rich and moist, that frosting really isn't necessary! If you come across a recipe that you think others would enjoy, please share it by leaving a comment. I would love to post your successes as well! My friend Angela has this awesome recipe for pumpkin soup. It is so good and easy, but the thing that makes it so good is half and half. Obviously, something you can't eat on the MSPI diet! No worries! I figured out a way to make it, and it's just as good -- without the dairy! If you have a lot of people to feed or want leftovers, definitely double the recipe! In a large sauce pan, saute onion in oil until tender. Add garlic, spices and salt. Simmer 1 minute. Add broth and simmer for 15 minutes. Stir in pumpkin and milk. Simmer 5 minutes. Pour in batches in blender and blend until creamy. Reheat and serve. 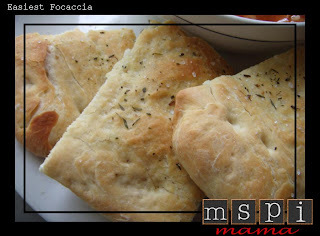 Quick Start with MSPI Mama: This is one of my Quick Start recipes. For more information about Quick Start, read the introductory post. Whenever I make chili -- which is often! -- I almost always whip up a batch of corn muffins to eat with it. I have a plain Jane recipe that I usually use, but I came across this recipe in the Feb./March issue of Taste of Home and thought it looked pretty good. It comes from the "Eat, Shrink and Be Merry" cookbook. 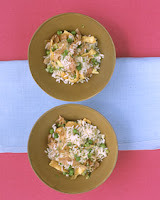 I had to make a few substitutions for MSPI, including the use of soured rice milk for buttermilk. To "sour" your rice milk, put 1-1/2 teaspoons of white vinegar in a measuring cup and add enough rice milk to the vinegar to reach a 1/2 cup. And in case you're wondering: Cream-style corn doesn't have cream in it! It's found in the canned food aisle next to the regular corn. The muffins come out very dense. Delicious with honey! Preheat oven to 375 degrees. Spray a 12-cup muffin tin with cooking spray and set aside. In a large bowl, combine flour, cornmeal, sugar, baking powder, baking soda and salt. Set aside. In a medium bowl, whisk together corn, soured rice milk, egg, oil and diced green chilies. Add wet ingredients to dry ingredients. Stir just until dry ingredients are moistened. Divide batter among 12 muffin cups. Bake for 15-20 minutes, or until a toothpick inserted in center of muffin comes out clean. Be careful not to over bake. Remove muffins from tin and cool slightly on a wire rack. Best if served warm!